It is nice to occasionally sit down with a film meant simply to amuse you for a while. Something that won't change your life, though it will lighten your mood. Wanted! 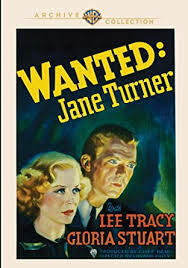 Jane Turner (1936) offers this kind of uncomplicated, lively entertainment. Now available on DVD from Warner Archive, it is a snappy, high-spirited 66 minute window into what the world would be like if everyone thought of that clever remark before they went home for the night. When the driver of a mail truck is murdered in a robbery, the U.S. Postal Service puts two of its sharpest postal inspectors on the case. Tom (Lee Tracy) is tasked with the tough guy stuff, while Doris (Gloria Stuart) is enlisted to cover any issues that may require the "woman angle." In reality their contributions are more fluid, because it wouldn't be a comedy if everyone followed the rules. Stuart and Tracy are a pleasant pair, more cute than funny, but always a pleasure to watch. It's always slightly depressing to watch Tracy in his post-code flicks; the comedian seems defanged without those racy twists of plot and script. He's so polished at this point in his career though, instinctively attuned to the laugh in a line and ready to pounce. Stuart is appealing as well and snappy enough to keep up with her leading man. Despite its brief running time, the film is on the edge of wearing out its welcome by the end. It's possible that it could have even worked as a short. To fill it out to feature length there are a pair of stories involving postal customers: one about an elderly man who waits in vain for a letter from his son, the other featuring a pair of female con-artists who make a living raking in traveling expenses (or "rural sugar") from farmers looking for mail order brides and who end up with only empty pockets. It's all superfluous, but entertaining. Director Edward Killy was an unusual figure in studio age Hollywood. He's one of the few prolific assistant directors to also work steadily as director. As assistant he worked on high profile productions like Gunga Din (1930), The Hunchback of Notre Dame (1939) and Alice Adams (1935). His solo efforts were usually westerns, which makes this little comedy an interesting anomaly in his career. Overall this is a cute flick. There's a bit of action, some high-tension suspense scenes and a few good laughs. Stuart and Tracy are a pleasant team, though it is clear why they never set the world on fire together. That doesn't always matter. Sometimes you just need to smile. The disc image is good. Sometime the picture dims a bit, but that does not significantly affect the viewing experience. There are no special features on the disc. Glad you had fun with it too, just a "little" movie but I enjoyed. I wish they still made them like this Laura. Just a pleasant little escape. It was lovely!